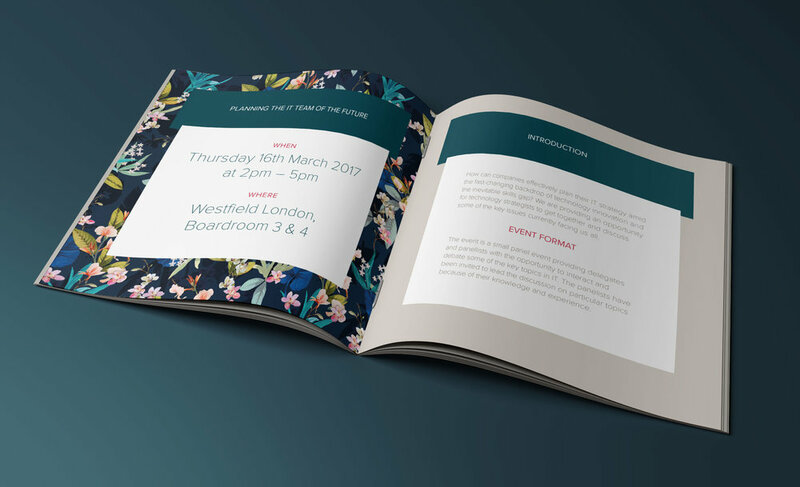 KETL Business Development Manager, Helen Woodcock, required an invitation booklet to an event hosted by them in conjunction with Monsoon / Accessorize. The event was to take the format of a panel discussion, around the subject of planning the IT team of the future. It would provide the opportunity for technology strategists to discuss key issues facing them in a future of fast-changing innovation and an inevitable skills gap. Helen required an invitation booklet design that could be printed, as well as emailed. This needed to be joint branded Monsoon and KETL, and contain information about the event and the panellists that would be speaking. After initial discussion with the client, it was decided that the booklet should take on slightly more of a Monsoon / Accessorize look and feel, than KETL, using a flowered material image provided by the marketing team at Monsoon. KETL branding was added subtly on the front cover and then more heavily on the back cover with contact details. The resulting booklet was printed digitally as well as being emailed as a single page pdf to delegates.